AREA TEAMS INCLUDED: Brackenridge, Brooks Academy, Burbank, East Central, Jefferson, Kennedy, Providence, Sam Houston, Southwest, Young Women’s Leadership Academy. South San (1-0) served 16 aces, including a whopping six from Lauren Estrada, to claim a five-set victory Wednesday at Brackenridge (0-2). Other big servers who helped the Bobcats recover from a Game 1 loss were Erica Jimenez (3 aces), Giselle Mata (2 aces) Angel and Salazar (2 aces). Marquanique Freeman and Anesha Kincheon each delivered two aces for Brackenridge in the non-district match. Estrada also contributed four kills in the Bobcats’ season-opening 19-25, 25-20, 25-15, 23-25, 15-10 win. Mata produced eight kills and Angel Salazar (2 blocks) added four. Jimenez had a team-high 16 set assists and Kristen Farias dealt five. Miranda Gonzalez was credited with three digs. Kaitlyn Serna smacked three blocks. For the Eagles, Freeman distributed 33 assists (6.6 per game). Brackenridge received 25 digs from Kathy Sifuentes, 10 from Emily Martinez, nine apiece from Jolicia Shelton-Brown (13 kills) and Freeman and eight from Kincheon. Skyler Reyna finished with eight kills and Eshe Malone had seven. In a battle of recent District 28-3A rivals, the Hurricanes (2-0) turned it on in Game 5 at Sam Houston to defeatg Poteet (0-1). Sam Houston will compete in 28-5A this season. The Hurricanes edged the Aggies 15-13 in the decisive game, after dropping the previous two games 25-18 and 25-21. Sam Houston won the first two games 25-20 and 25-16. Junior setter Rita Davis dealt 33 assists for Sam Houston. Sophomore libero Datreese Thomas tracked down 11 digs. Karisma Mitchell pounded 16 kills. Natalie Coburn added four blocks. Tiaria Mackey notched two aces. The Bengals (2-0) began their 2014 season with non-district wins over Hawkins Tuesday and St. Gerard Wednesday. Brooks Academy rallied after losing the first game 25-20 to St. Gerard. The Bengals then clicked into gear to end the match 25-15, 25-10, 25-19 at the academy. No Brooks Academy statistics were available from the Bengals match against the Royals. Tuesday at Hawkins, senior outside hitter Makayla Quintanilla served five aces for the Bengals. The Provets (2-0) triumphed 25-12, 22-25, 25-22, 25-16 Wednesday over Burbank (0-1) in a non-district match at Providence. Provets freshman setter Mia Ybarra was credited with 21 assists. Sophomore Juliet Alanis was a dual threat with 23 digs and three service aces. Up front, Hannah Sasser contributed six kills and two blocks. 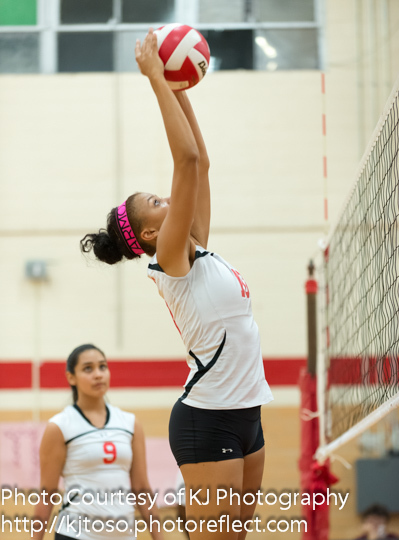 In their season opener, the Bulldogs were led by junior Antwanisha Riddle, who compiled eight blocks and six kills. Rebekah Valma added 12 assists. Laura Morones produced 10 digs.